Home Features Jesters’ Fair is this Sunday! 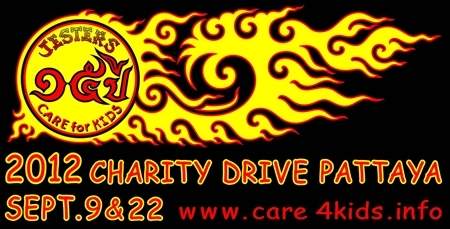 The main events of the Jesters Care for Kids Charity Drive 2012, sponsored by Glencore International and the Canadian Jackalope Open, will start this weekend on Sunday, September 9th. 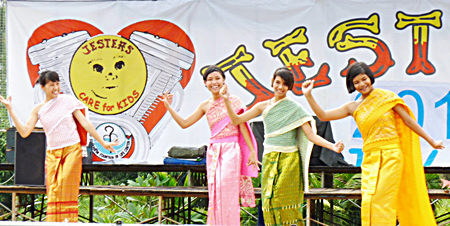 First up is our Jesters Children’s Fair at the Diana Garden Resort in North Pattaya, where it has been held since 2002. The fun starts from 10 a.m. and lasts till dusk, so prepare for a great day out! Last year we saw our first rainout in 13 years of Children Fairs and, as a result, many well-wishers have expressed their hopes for clement weather this year. However, having rain at this event is nothing new; though it’s generally been the kind typical of the monsoon season and usually temporary. Girls from Ban Jing Jai Orphanage perform a traditional Thai dance after the rain stopped and the sun came out at the fair last year. Last year was a unique freak storm that dumped rain on Pattaya for 15 hours straight and flooded the streets of the city to an extent not seen in 50 years. So, even after the rain subsided around midday, the flooding prevented people from getting to the Fair. Fortunately, many of our project kids still managed to get there and had their fun. The fact of the matter is rain or shine, the show goes on. This year we are celebrating our 15 years of organizing charity drives, starting with our 14th annual Children’s Fair. The focal point will be the stage with project kids’ performances in the morning and teen bands in the afternoon. There will be field games in between culminating with the tug-of war and PSC raffle drawing. We will wrap up the show late afternoon with music from Leo Blues Band. * All stalls are approximately 4X4 meters in area with two tables, two chairs and one electrical outlet (approx. 3 amps). Please note that the system will NOT run electrical appliances that draw a lot of power. * For safety reasons, no vehicles will be allowed in the stall area on Sunday, September 9th after 0930. Many stallholders choose to prepare their stalls and offload their heavy items the day before, on Saturday, the 8th after 4 p.m.
* The fair site will be opened from 6 a.m. on the day of the Fair. Official hours for the event are 10 a.m. to 6 p.m.
* There is no running water or ice available at the stalls, nor is there any money for change. Please bring trash cans/bags for your stall. * Banners should be no larger than .75 X 3.50 meters. * If you have not paid your stall fees already, Bill will collect the 1500 baht amount from you at the fair around midday. * Please secure valuables at all times. 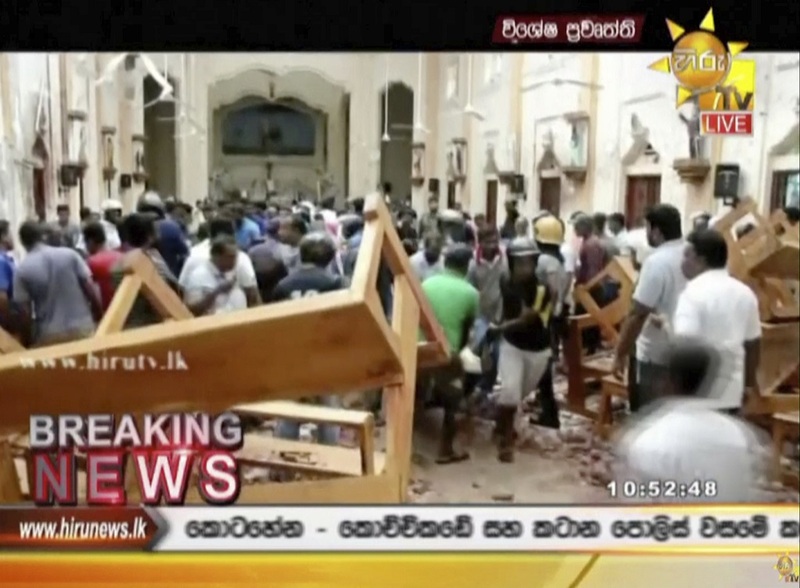 The organizers will not be responsible for any loss or damage that may occur. * Important Note! This year’s children’s coupons are PINK and are NOT redeemable for cash. Coupons will only be used internally by school staff for kid’s games. * Since we sell donated beer, please do not sell beer at your stalls. * For more info, please contact Bill at 089-930-3558. If you would like to learn more about our events, please visit us at www.care4kids.info or www.facebook.com/jesterscare.forkids. Otherwise, see you there! Please also remember that the Jesters’ Gala Party Night follows the Fair on Saturday, September 22nd at the Amari Orchid Pattaya. 93 Sunrise Tacos Taco, Burritos, Etc.